This guide argues that events are the milestones in creating partnerships, and one of the main milestones should be a conference or seminar at which all the key interests come together to commit their support to the new organisation. This is best held after a series of workshop, but before all decisions on projects and structure have been taken. Large meetings and committees are not good for working through difficult issues. You can often make a lot more process by taking some time out in smaller groups and reporting back. Introduce the issue to the large group, and set tasks for smaller groups. State time limits, how to report back, and arrange where each group should go. Break into smaller groups of not more than 6 to 8. Meet and discuss the issue. Appoint a facilitator, recorder, reporter if necessary. Report back to the large group. As an alternative reshuffle into new small groups and report back to each other within the groups. Among the committee meetings and workshop sessions allow time for social events where people can get to know each informally. People are far more likely to get involved and support something which is fun. Development trusts and other partnerships of any size will require staff, and some of these at least should be directly employed by the Trust. Secondees and volunteers can be immensely valuable, but only operate effectively if they have support and guidance. Consequently the Board of a Trust will have to consider appropriate recruitment procedures, terms and conditions of service and other issues of staff management. Development trusts often have two senior key staff &endash; the executive director and the project manager &endash; supported by an administrator. The start up process for a Development Trust or other partnership should be directed by a steering group. 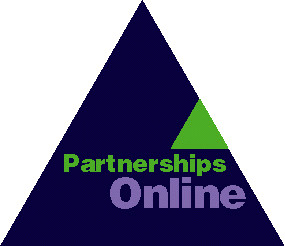 If the partnership is to become a company, the steering group should be a 'shadow' Board &endash; acting as if they were the Board, even though they may not be the same individuals who will ultimately take responsibility. Clarify accountability and terms of reference. Run some sessions as workshops, rather than formal committee meetings, and develop agreed action plans. Whoever holds the cheque book controls the programme. Should this power to lie with an existing organisation? Staff will follow the directions of whoever pays their wages. In this context information is power, and whoever produces papers, agendas and writes the minutes controls the meetings. On the other hand, incorporated structures like companies generate extra costs and responsibilities for those on the Board. I suggest that for big programmes where a number of interests want a real stake over a long period, go for a company. For short-term projects work through existing structures, and fora. See also Accountability, Constitution, Terms of reference. It is tempting, in forming a partnership, to concentrate mainly on formal structure &endash; because that determines where power and control lies. However, just as important in the long term is the style of the organisation: is it open and accessible, does it offer opportunities for personal development to those involved, is it an empire-builder, or is it prepared to work with others? A successful partnership will have a shared view of these issues internally, and practice what it preaches externally. A useful early exercise for a steering group is to brainstorm the words by which members would like the partnership described. Ensuring their own operations are sustainable by developing an asset base or other means of earning revenue to cover core costs. Promoting the development of sustainable local communities offering a high quality of life for those living and working there. Environmental sustainability: the principle that development in this generation should not compromise the ability of future generation to meet their needs. Brainstorm issues under each heading. Strengths and weaknesses relate to internal matters for the group or organisation, opportunities and threats to the external. Divide up a chart, and ask people to fill in and stick on Post-it notes. Draw up a summary and discuss how to build on your strengths, do something about your weaknesses. make the most of the opportunities, avoid or eliminate the threats. Turn these conclusions into an Action plan. Additionally they can get tax relief on money donated from others e.g. gift aid, and investment income is paid at gross not net. Team building is the process of helping a group develop shared aims and objectives, values and a plan to put them into action. People working together are better able to get to know each other than, for example, members of a steering group meeting every month or two &endash; so team building workshops can be particularly important for partnerships. If possible use in a trainer who specialises in team building to plan a programme. If not, an 'away day' with a facilitator to work on simple techniques like Brainstorming and SWOT can achieve a lot. The purpose and membership of the group. Who services it with agendas and minutes. How often it meets &endash; and for how long. The topics or issues the group covers. lThe powers of the group to make decisions. What funding it has, if any. To which committee or group it reports back. Draw a horizontal line on a piece of paper. Graduate it into appropriate blocks of time (days, weeks, months). The first mark is NOW, the last the completion date. Think of all the tasks to be completed. Place the tasks on the time line in the order of when they have to be done, and which are the most important to do at a particular time. Draw out and deal with any suspicions from past contacts. Be open and honest about what you are trying to achieve &endash; and about any problems. Be prepared to make mistakes &endash; and admit them. If a Development Trust or other partnership is a charitable company, the Board of directors will also be trustees &endash; that is, they will have responsibilities under the Charities Acts as well under company law. These responsibilities are wide ranging, and trustees should be well briefed and offered training in their role. Values are statements of what we consider important. Since they may be emotive, political, and difficult to express, they are frequently hidden. However it is difficult to understand each other or reach agreement if we are unclear about values &endash; and so shared values are fundamental to successful partnerships. For example, council officers faced with a tight project timetable may be frustrated by a community group which insists on numerous meetings, held in the evenings, leading to the appointment of a representative steering group. The officers value cost-effective delivery of 'product' acceptable to their political masters and the Government; the group values openness and democratic process. In groups where there may be underlying differences of values it is often most productive to concentrate first on what there is in common by discussing outcomes &endash; what you would like to happen at the end of the day &endash; and how you can get there. The idea of a vision of the future seems to me rather broader than purpose or mission, because it places more emphasis on values and approach &endash; how you do things as well as the result you achieve. Vision may be a helpful term if you are using participation techniques that encourage people to create pictures of what they want, or develop models. Partnerships need vision &endash; and visions. See Past and Future, and the Vision information sheet. Self-help groups of people with a shared interest seeking to assist each other. Community groups of activists concerned with a locality or local issue. Small local charitable organisations with management committees and paid workers. National charities with local branches. Bodies like Development Trusts which may see themselves as not-for-profit companies. There will be a wide range of community and voluntary organisations in any community, and they may be concerned about the creation of any new body which may compete with them for scarce resources. They may also be suspicious &endash; with good reason &endash; of initiatives which are simply devices for large organisations to access Government funds by claiming they are working in partnership. Anyone seeking to create a Development Trust should consider what benefits the Trust will bring beyond those offered by existing bodies, and seek to recruit them as allies in the start up process. They may otherwise become enemies. Create clear terms of reference. Set a limit on how long they continue. Encourage creative thinking rather than formal committee procedures. This technique , which combines action plans with a time line, can be useful in planning the development of a partnership. However, while helpful, it is important to recognise that partnership building doesn't run on rails, and there will be many excursions and diversions from the chart! Set up a calendar of days, weeks or months for the process, with the period across the top of a sheet of paper. Identify main events like meetings and publications as 'milestones' in the process, and position them as on a time line. Work out the subsidiary tasks to achieve the milestones, including which must be started before or after others. Draw these under each other as lines across the calendar, the length of line indicating time to complete, with start and finish points marked. Project management computer software is available to carry out workload planning, but can be rather time-consuming to use.